We still need volunteers to man the Neuroscience Ireland stand at BNA2017 to promote BNA2019 which will be held in Dublin. If you are attending this year's BNA2017, then we ask that you sign-up for at least one session on the BNA2019 promotional stand using the Doodle Poll here. 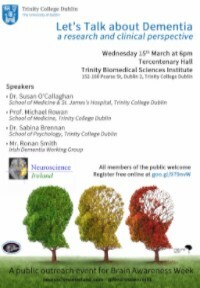 Neuroscience Ireland are delighted to invite you and your families, friends and colleagues to a free public lecture series at Trinity College Dublin to mark Brain Awareness event 2017. Details of this event are posted here. Screening of Parkinson's disease documentary "Feats of Modest Valour"
Neuroscience Ireland, in association with NUI Galway's NeuroSoc and FilmSoc, are delighted to invite you and your families, friends and colleagues to a free public screening of the SFI-funded Parkinson's documentary "Feats of Modest Valour" in NUI Galway to mark Brain Awareness Week 2017. 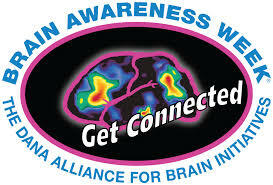 The Galway Neuroscience Centre invite you and your children to the "My Amazing Brain" in the Aula Maxima at NUI Galway to mark Brain Awareness Week 2017.